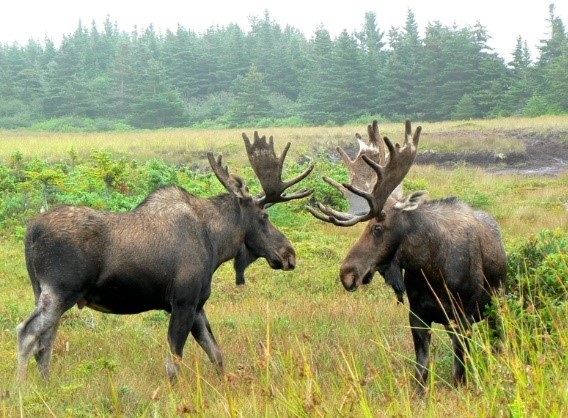 National Parks with moose, caribou and bear. Guided evening walks to a woodsy moose hangout. An island, surrounded by the favourite snacks that draw humpback, orca, dolphins, fin whale, seabirds, seals, otter into its coves. A zodiac for visiting those that don’t come in to the water’s edge. At day’s end, while you sit on the cliffs watching icebergs, an arctic or red fox may join you. Atlantic salmon, so close you can feel the spray, as they repeatedly jump a waterfall to return to spawning grounds. And, of course, you can’t go home without seeing puffins! Polar bears, untamed and magnificent in a terrain that does them justice – our apex predator that will leave you awestruck. Our landscape is unrivaled in beauty and variety – thousands of kilometres of dramatic coastline frame fjords, forest, tundra and mile-high mountains, creating an ideal setting for your wildlife quest. Virtually the entire province is public land, where animals roam free, and you visit them in their natural settings.